Don’t get too excited, this is just a reprint. A real Whitey Ford card is quite valuable compared to one from last decade. 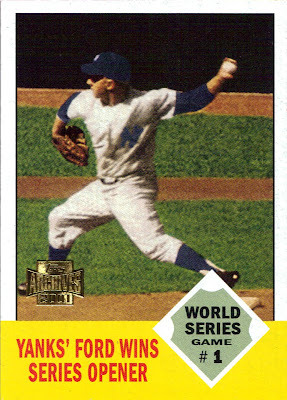 Ford was the Yankees’ left-handed ace in the 1950s and ‘60s, garnering a Cy Young Award, several World Series records and six World Series rings before reaching Hall of Fame status in 1974 (2nd ballot). If you are having trouble picturing him, imagine Andy Pettitte but a couple runs better ERA-wise and a couple more rings.